Egypt and Jordan made the basketball finals at the Arab Women Sports Tournament 2018 (AWST) every spectator's dream with a match whose fate was decided by one point. Egypt's Sporting Club bagged the gold, winning against Al Fuhays with a score of 63-62. Organized by the Sharjah Women Sports Foundation (SWSF), under the patronage of Sheikha Jawaher Bint Mohammed Al Qasimi, wife of the ruler of Sharjah and chairperson of SWSF, AWST ran from Feb. 2-12, 2018, and featured 1,000 female Arab athletes form 69 clubs representing 17 Arab countries, who competed in nine sporting disciplines that are part of the Olympics list. In the midst of a celebratory spirit, which filled the SWSF sports court, the closing ceremony also awarded the top 3 nations who secured the largest number of gold medals. Bahrain received first place for winning a total of 12 gold medals, Egypt came second with 9 gold medals and Algeria ranked third with 7 gold medals. 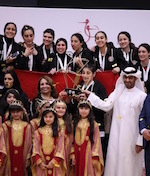 The winners were honored by Sheikh Khalid Bin Ahmed Al Qasimi, head of AWST's Supreme Organizing Committee; accompanied by Sheikha Hayat Bint Abdulaziz Al Khalifa, head of the AWST Supervisory Committee and member of Bahraini Olympic Committee; Ismail Al Gergawi, president of the UAE Basketball Association and Arab Basketball Association; Nada Askar Al Naqbi, deputy chairperson of AWST Supreme Organizing Committee, head of its executive committee and director general of SWSF; Khaled Al Midfa, secretary general of Authority for Youth and Sports; Marwan Al Shamsi, director of Bee'ah; Abdul Latif Muhammad, director of public relations at Etisalat; Col. Ashour Bin Sabt Bin Ashour, drector of Special Task Department; Khalid Al Hussein, director of the sports affairs department at the General Authority of Youth and Sports. Following the results of the final basketball match, the gold medal was presented to Egypt's Sporting, silver medal to Jordan's Al Fuhays and bronze medal to UAE's Sharjah Sports Club. Individual honors and recognitions followed. Menatuallah Muhammad from Sporting Club was awarded the lead scorer and all-rounder trophies, and Rana Nabeel from the same club won the best three-point scorer. Karima Karim from Sharjah Sports Club for Women won the point guard player award, while Rubie Henry from Al Fuyais claimed the best winger trophy. After the coronation ceremony, the three Excellence Cups were given to winners. Sheikh Khalid Bin Ahmed Al Qasimi announced that Sharjah Sports Club was the winner of the Sports Excellence Cup, and Nada Askar Al Naqbi, along the management administrative staff and players received the cup. Sheikha Hayat Bint Abdulaziz Al Khalifa announced Jeddah United Club as the winner of Committees Club for Fair Play, which was delivered to them by Abdulrahman Al-Masad, president of Saudi Arabian Basketball Federation. Al Naqbi presented the Sport Excellence Cup to National Security Sports Association Club from Algeria. In a bid to honor everyone who contributed to the success of the tournament, the SOC of AWST felicitated the referees of the basketball finale, as well as the best cheering fan; Sharifa Muhammad from Bahrain. Sporting Club from Egypt had a strategy in place since the very first match of the tournament. They were at AWST to emerge as the basketball champions, a chance they missed marginally in the third edition of AWST in 2016, as they took home the bronze. This edition was different as they not only won the basketball finale, but also remained undefeated throughout the tournament. Despite winning the first period with a score of 17-12, Sporting lost the second period to Jordan's Al Fuhays with a score of 22-11. The third period saw a ferocious battle between the clubs that ended in a 17-17 draw. The fourth and final period saw a critical turn of events and Sporting were able to level and win with a score of 18-11, winning the match with a single-point difference 63-62. The exceptional performance of Menatuallah Muhammad, who scored 28 points, and Asrar Majed, who scored the winning basket, played a vital role in Egypt's victory. 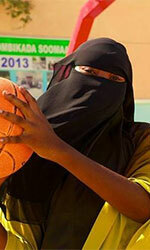 Through Egypt's three participations in AWST, they have claimed the basketball title for the first time. Sharjah Sports Club, hosts and winners of the previous edition, finished in third place in AWST 2018. Egypt's Sporting Clubcemented their spot at the top of the basketball table of the Arab Women Sports Tournament 2018 (AWST) following their third win over Bahrain's Mawaheb Club with a comprehensive seven-point lead.The fifth round of the competition was a show of pure talent for the Egyptians who notched up a 96-89, continuing on their undisputed march to a place in the finals of the fourth edition of the event.AWST 2018 is taking place under the patronage of Sheikha Jawaher bint Mohammed Al Qasimi, wife of His Highness the Ruler of Sharjah, Chairperson of the Supreme Council for Family Affairs (SCFA) and Chairperson of Sharjah Women's Sports Foundation (SWSF).In another match, Sharjah Sports Club for Women clincheda massive 41-point win over Kuwait's Al Fatat Club with a score of 91-50, making their way to into the basketball finals.The Sporting Club - who remain undefeated in the event - hasa tally of six points in three wins, followed by four clubs who share five points. Due to this point gap, the Sharjah Club secured second place with a 97-point gap after the home club notched up 247 points compared to 150 points in their net.With a 48-point gap, the Bahrainis came in the third place after they notched up 257 points compared to 209 points in their net. Jordan's Fuheis took fourth position with 220 points against 199 points, followed by Kuwait's Al Fatat Club with 269 points against 309 points, while Saudi Arabia's Jeddah United fell off the competition with only four points. Bahrainmissed a chance to defeat the Egyptians after they ended the first set with a score of 45-39. The Bahrainis won the first quarter with a 21-12 win over the Egyptians followed by a tie 24-24 in the second quarter. But the Egyptians lifted the game in the third and fourth quarters and won with score tallies of 24-19 and 33-22.The Egyptians owe their win to Menna Allah Mohammed who earned her team 30 points, and her peer AsrarMajd, who contributed 21 points. Although Bahraini player, Brandi Rani,was named the highest individual scorer with a tally of 34 points, it wasn't enough to winwith the other players on the team colleting only 55 points.Meanwhile, the Sharjah Sports Club for Women defeated Kuwait's Al Fatat Club in the four quarters with sets of (28-19, 22-8, 22-6, 19-7). The win is attributed to the brilliance showed by Sharjah's players Karima Karma and leeside Ziomara who scored 28 points each, alongside their compatriot Amal Bin Haider who scored eight points. Bahraini SharKidnali managed to score 15 points. It was a day of do-or-die affair in the third round of the basketball event at the Arab Women Sports Tournament 2018 (AWST) as the teams vied for top spots in the qualifying table before heading into the finals decider in the fourth round. Sharjah Sports Club for Women showed its intention to play a leading role in proceedings with a fairly comfortable win over Somalia's Mogadishu by 86-50. Meanwhile, in a marginally tighter game, Egypt's Sporting Club defeated Jordan's Al-Fuhays 73-55. Bahrain's Al-Mawaheb then celebrated its second victory after defeating KSA's Jeddah United with a lesson in sharp-shooting and a score 92-47. By the end of the third round, Sharjah and Al-Fuhays topped the table with five points each, followed by Al-Mawaheb and Sporting in second with four points for each, and then Al-Fatat, Mogadishu and Jeddah United all coming in third, with three points apiece.